Synopsis: Follows hard-to-please Aurora looking for love and her daughter’s family problems. Did You Know? On a break between filming for Footloose, John Lithgow was called in to replace another actor. His scenes were filmed in just three days. Quotables: EMMA: And, don’t yell, but I think I’m pregnant again. I really hated this movie the first time I saw it, and I think it was probably because I already knew that Debra Winger died at the end. So that was all I was able to think about. But the second time round, I’m enjoying it a lot more. 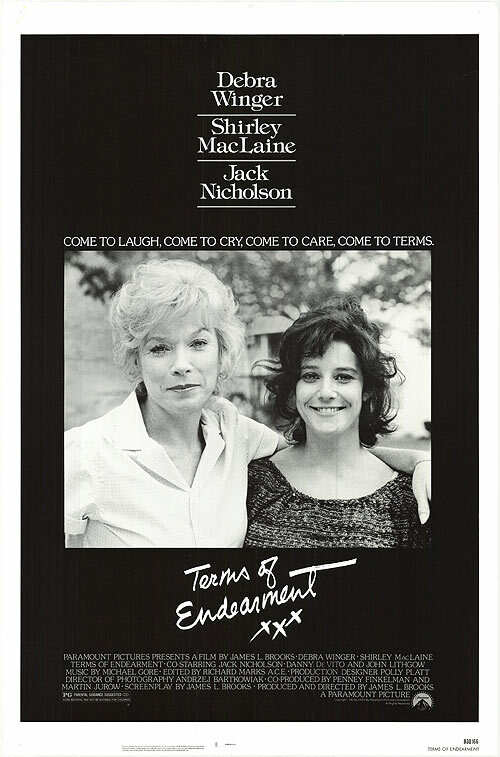 While Winger and MacLaine give very riveting performances, I am less-than-fond of Nicholson. He’s may be a Hollywood legend, but the more I’ve thought about it, the more I’ve come to realise that most of his performances are the exact same. They’re not simply the same type of character; there have been many actors who have played multiple characters of the same archetype, but they’ve managed to bring something different to their characters. Nicholson plays the same archetype in the same fashion: shallow, vain, and flippant. He does redeem himself with some sincerity and humility at the end. But back to Winger and MacLaine. Their tempestuous relationship as mother and daughter is honest and real. Immediately following her daughter’s death, every emotion imaginable pulsates from MacLaine, filling your heart with grief. In that instant, you truly know her loss.